Hannibal-LaGrange University wrapped up another successful homecoming. The weekend was filled with fun events as well as temperamental Midwest weather, but nothing could stop the Trojan spirit that was felt all throughout campus. The banquet, alumni games, and Trojan Trek, are HLGU Homecoming staples, along with various other festivities that were well attended throughout the weekend. The weekend began with the induction of new members into the 50 Year Club who graduated from Hannibal-LaGrange University more than 50 years ago. This year the honored class of 1967 was recognized. The 50 Year Club members enjoyed a luncheon on Friday, as well as tours of the campus to see the newly renovated dorm lobbies and to reminisce about their time here. Friday night featured the opening reception of the Alumni Art Exhibit for Casi Gray ’08, a painter, and Neil Sneed ’12, a photographer. Students took part in the annual Homecoming Banquet in the Mabee Sports Complex Friday evening. Delicious Italian food and specially made Italian sodas completed the meal. 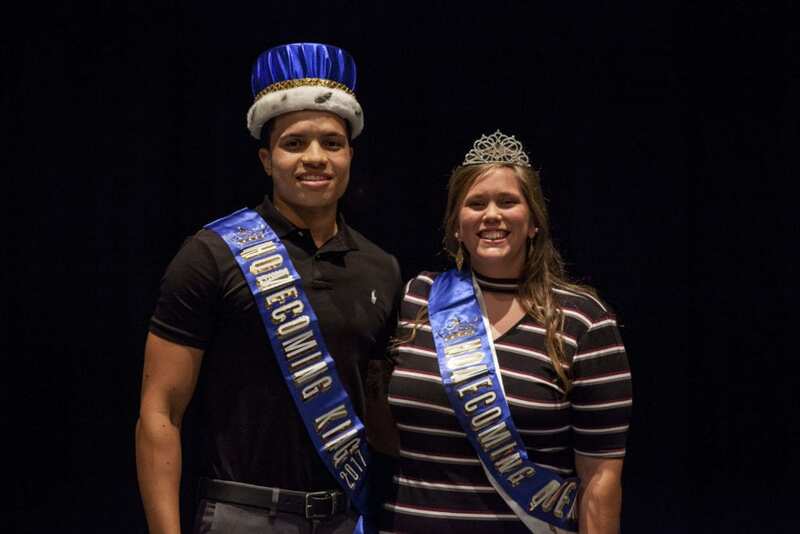 Following dinner, students gathered in the Roland Fine Arts Center for Alumni Awards, crowning of the Homecoming King and Queen, and entertainment. This year’s Outstanding Service Alumni Award was presented to Don and Gerry Dehner. The Dehners were both born in rural Lewis County and graduated with their associate’s degrees from Hannibal-LaGrange in 1955. Don worked for many local elementary schools in his career. He also served as maintenance staff, student director, and as registrar at Hannibal-LaGrange. Gerry worked at Mark Twain Savings and Loan and Marion County Mutual before coming to HLGU and serving as receptionist in the business office for 30 years. The Dehners are members of Calvary Baptist Church, Missouri Campers on Mission, and Missourians on Mission. Outstanding Young Alumnus recipient, Bo Jennings, received his Bachelor of Science in Liberal Studies from HLGU in 2007. Currently, he is vice president of events and marketing at Cumberland Hospitality Group. He is also a guest lecturer at Belmont University for the event management certification program, and has worked with large events such as the SEC Men’s Basketball Tournament and the Music City Bowl. The Distinguished Alumnus Award was presented to Carole Jo Riley. She received her associate of arts degree from HLGU in 1963. Riley served HLGU for more than 40 years as an instructor of music theory and piano. In 2013, she funded the Carole Jo Riley Endowed Scholarship which is awarded every year to a full-time HLGU piano or music major selected by the music faculty. Riley is an active member of the Hannibal community and of Calvary Baptist Church, where she serves as a facilitator with GriefShare. Members of the homecoming court took part in pep-rally-style games to begin the evening’s entertainment. Kazden Lewis was crowned Homecoming queen and Timothy Pace was awarded king. Kazden is a social work major from Farmington, MO, and Timothy is a criminal justice major from Staten Island, NY. Other candidates included Anna Burden of Kansas City, MO, Shelby Maupin of St. Peters, MO, Samantha Northrop of Snohomish, WA, Cassidy Winters of St. Charles, MO, Nicholas McMillan of Cape Girardeau, MO, Titus Vester of Sikeston, MO, Keith Schmutzler of Oreana, IL, and Joshua Casebolt of Brookfield, MO. Entertainment was provided by comedian Jaron Myers. Myers used his quick, witty humor, combined with musical talents to have the audience rolling. Saturday Homecoming events included the Trojan Trek 5k, and alumni games of women’s volleyball, and men’s and women’s soccer. The HLGU women’s volleyball team was unsuccessful in their match against Freed-Hardeman, as was the women’s soccer team, but the men’s soccer team won their game after a few minutes of overtime. A special Sunday chapel service was held in the Parker Theatre of the Roland Fine Arts Center at 10:30 am. Praise Song led worship, and Dr. Anthony Allen presented the message. A Homecoming Farewell Luncheon immediately followed the chapel service in the Partee Center. Be sure to join us for Homecoming next year, October 5-7, and Winter Homecoming on Saturday January 20, 2018.